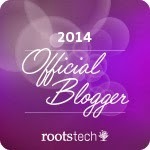 Have you met the official RootsTech bloggers yet? As the date for RootsTech fast approaches, these folks will give you the scoop on the latest developments and news. They will also report during the conference and give you recaps when it's over. The people behind RootsTech have done a great job selecting bloggers from all backgrounds and perspectives. No two bloggers will cover the conference the same way. I hope you will take some time to visit the blogs of each official blogger and add them to your regular reading schedule. You won't be disappointed. Thabks for the shoutout, Amy. I can't wait to get to Rootstech and meet up with all of the geneabloggers who will be there.